When spring arrives, we can lighten up our looks and our skincare. 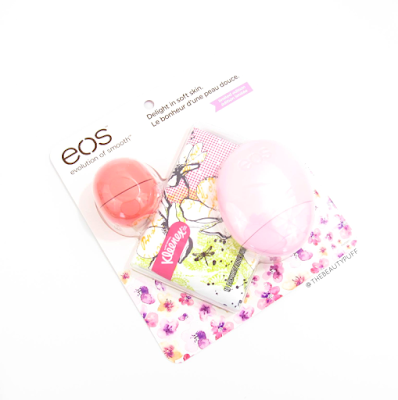 This season, EOS has introduced a Limited Edition trio featuring their Pink Grapefruit lip balm, Berry Blossom hand lotion and a convenient Kleenex slim-wallet pack that you can take with you in your purse. No matter what time of year it is, our skin needs moisture. I use lighter formulas with fresh scents this time of year so this EOS set is perfect. The Pink Grapefruit lip balm smells amazing - unlike any other lip balm I own. It has a fresh, citrus and slightly sweet scent that's perfect for spring. 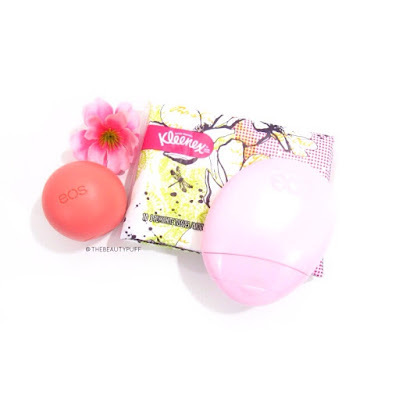 I love reaching into my purse and being able to find my EOS lip balms because they don't get lost in the shuffle of other products. Even though my hands don't get nearly as dry in the spring as they do in winter, I still have to moisturize! I prefer light, non-greasy formulas with more spring-inspired scents. Berry Blossom is a perfect fruity, floral blend for warmer weather. I would wear this as my only scent throughout the day because it's not too strong but gives just enough sweetness to the skin. It smells delicious! This lotion has aloe, shea butter and antioxidants to keep your hands smooth all season long. As a finishing touch, EOS has included a Kleenex slim-wallet pack. I've never seen a Kleenex pack this size, but I love it! It's slim enough to fit in the outer pocket of a purse or diaper bag without taking up too much space. It's also a great shape to slide into a makeup bag for trips. The pack opens like a wallet with two separate pockets for the tissues. The print is really cute too. I think if I had more of these packs around the house, I'd remember tissues a lot more often! The EOS Limited Edition Spring Pack is available on the EOS website, Ulta, Target, Drugstore.com and many other retailers!